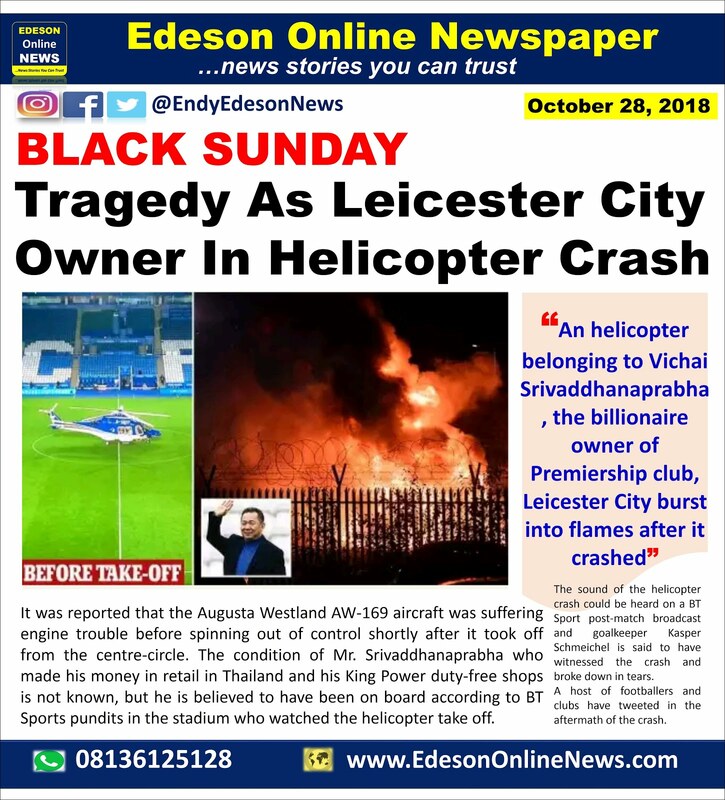 An helicopter belonging to Vichai Srivaddhanaprabha, the billionaire owner of Premiership club, Leicester City burst into flames after it crashed yards away from the King Power stadium after taking off from the pitch, on Saturday night. It was reported that the Augusta Westland AW-169 aircraft was suffering engine trouble before spinning out of control shortly after it took off from the centre-circle. 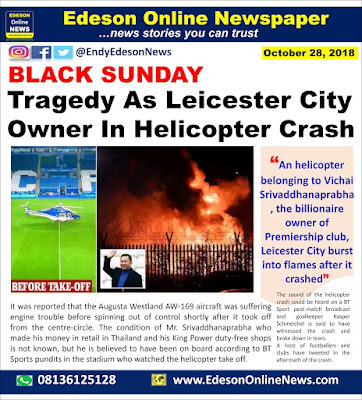 The condition of Mr. Srivaddhanaprabha who made his money in retail in Thailand and his King Power duty-free shops is not known, but he is believed to have been on board according to BT Sports pundits in the stadium who watched the helicopter take off. witnessed the crash and broke down in tears. A host of footballers and clubs have tweeted in the aftermath of the crash. Vichai Srivaddhanaprabha, two members of his staff, the pilot and a passenger were killed when the aircraft crashed at about 20:30 BST on Saturday. Mr Srivaddhanaprabha, 60, who was married and had four children, bought Leicester City for £39m in 2010. Under his ownership the club won the Premier League in 2016, having started the season as 5,000/1 outsiders.